Ritz Crackers are a brand of snack cracker introduced by Nabisco in 1934. 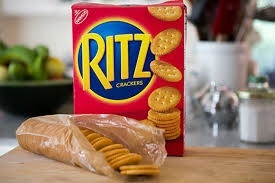 Outside of the United States, the Ritz Cracker brand is made by a subsidiary of Mondelēz International. They are circular in shape, salted lightly on one side, and have a small scalloped edge. A single serving (approximately 5 crackers) contains 79 calories, 1 gram of protein and 4 grams of fat, or 70 calories and 2.5 grams of fat for the Whole Wheat variety.